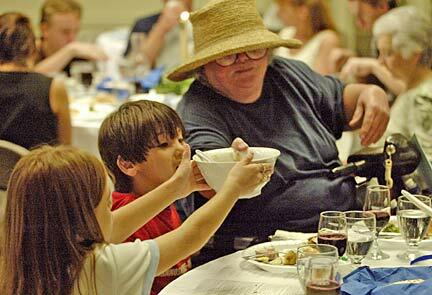 Wanda Michaelsen passed a bowl of haroseth to Elizabeth Bluestone, 9, as her brother Christopher, 6, watched during the Passover Seder meal at St. Andrew's Cathedral on Wednesday night. The feast marks the Exodus of the Jews from Egypt. A service last night at St. Andrew's Cathedral re-created the Gospel story of Jesus washing the feet of the 12 disciples at his Last Supper. Don Owens, left, and Capt. 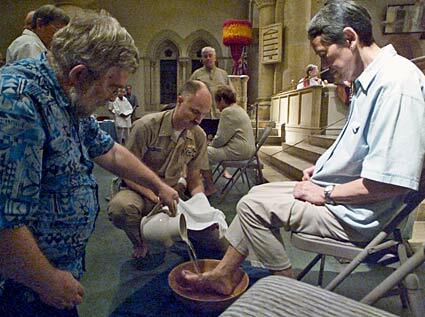 Matt Brown washed the feet of fellow parishioner Elizabeth Ho.